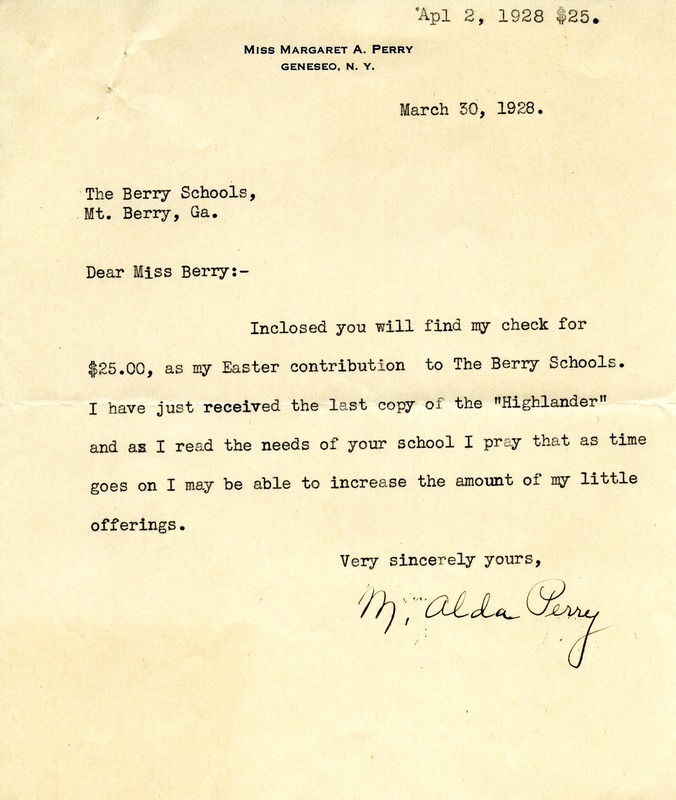 Letter to Martha Berry from Margaret A. Perry informing Miss Berry that she was paying $25.00 for her Easter Contribution to the schools. She also comments on the "highlander" in reference to the needs of the schools and sates to increase her offerings as time goes on. M. Alda Perry, “Letter to Martha Berry from Margaret A. Perry.” Martha Berry Digital Archive. Eds. Schlitz, Stephanie A., Jordan Brannen, Haley Fortune , et al. Mount Berry: Berry College, 2012. accessed April 18, 2019, https://mbda.berry.edu/items/show/8673.